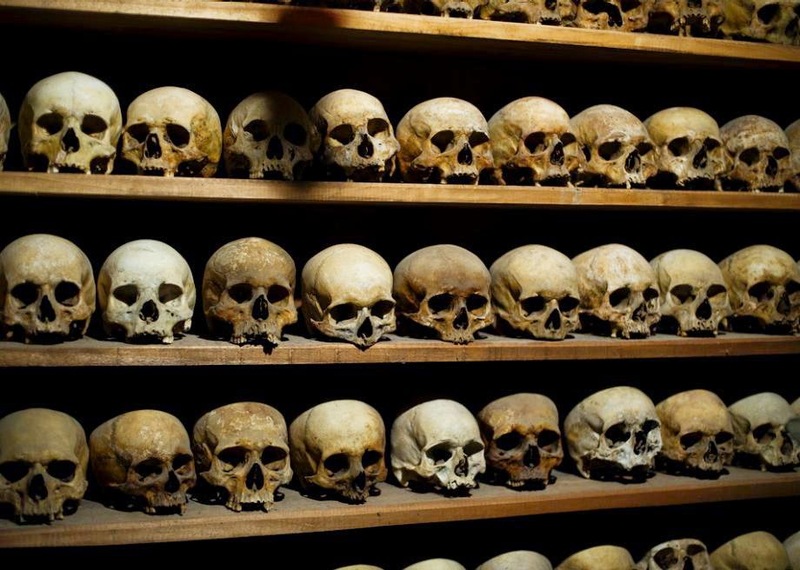 WHEN a scattering of nomadic 9th century Greek monks, who lived out their lives in solitude in remote caves 350km north-west of Athens, found themselves facing growing threats from marauding Turkish invaders, they decided that their safety could, in fact, be in numbers. So they moved to the base of one of numerous strange sandstone pinnacles that reached 500 metres or more above the surrounding Plain of Thessaly, and while continuing their individual lives of solitude within caves there, came together on Sundays and major important religious dates to jointly worship and pray. And ultimately they built a small chapel among the rocks for these gatherings, but when that too was plundered and many of its precious art works the monks had created were stolen, the monks started climbing higher into the fissures of their pinnacles until in the 11th century they had reached the tops of some twenty or more. There they used an elaborate system of retractable ladders and baskets on the ends of long ropes to haul building materials and other supplies, and even themselves and hired workers and pilgrims up to their retreats, and to spend the next 300 years constructing individual monasteries overlooking the surrounding plain. 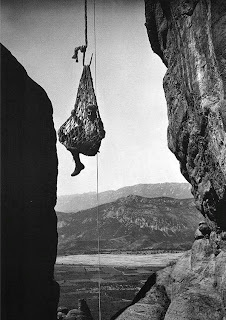 By the 14th century there were some twenty of these extraordinary places of worship that for seven centuries until the 1920s could be reached only by those ladders, or the baskets that swung so perilously off relays of ropes to the ground. 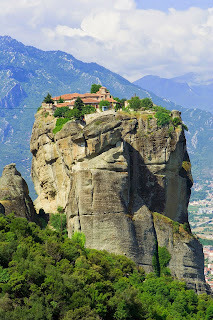 Modern-day scholars say that these Meteora Monasteries as they are known, Meteora meaning literally "suspended in the air," were not only important religious centres but ultimately academic and artistic ones as well – having been places of refuge at times of crisis for philosophers, painters, poets and deep thinkers, and who were credited with having saved the Hellenic culture and traditions. And in their later years Meteora also attracted a small community of nuns of the Eastern Orthodox Church who built a convent on one of the peaks alongside the Church's long-time monks, but today there are just five monasteries and that convent remaining, with none having more than a dozen full-time occupants. Just how the rare sandstone pinnacles that rise out of the Plain of Thessaly were formed is uncertain, but a major theory is that the Plain was once covered by an inland sea, and when this receded when the seabed rose, this action and subsequent weather conditions eroded the soft, elevated sandstone seabed leaving only the harder cores standing. The monasteries today are major, if remote, tourist attractions described as amongst the most spectacular of places to visit in Greece. And although they were attacked during WWII when Germany suspected they were concealing insurgents, and many of their art treasures were pilfered by Nazi forces, they still contain hundreds of priceless items reflecting the lives of their earlier occupants. 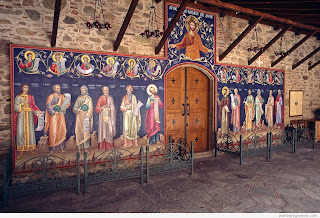 These include post-Byzantine murals considered amongst the most beautiful in Greece, frescos including one by Theophanes that depicts in gruesome detail the persecution of Christians by the Romans, intricately carved wooden crosses, embroidered funeral orations, icons by some of Europe's most-famed iconographers, and other eclisiastical treasures. One also contains shelves of skulls of former monks, while another became the richest after the Serbian Emperor, Symeon Uron gave all his wealth to the monastery to become an impoverished monk there. 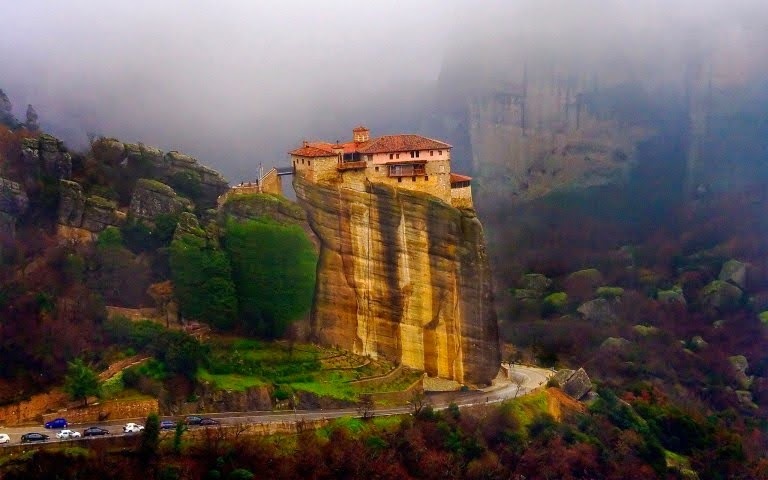 And in more recent times yet another, Agia Triada also known as the Holy Trinity Monastery, was used for scenes in the James Bond movie, For Your Eyes Only. 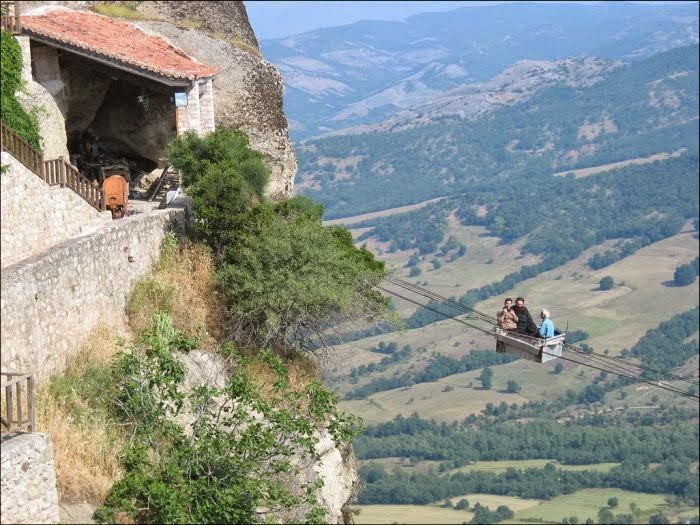 Thankfully the monasteries can be reached more easily today, with a bridge from an adjoining plateau reaching to one, and with bridges, ropeways, roads and other links from there to most of the other five – although one still requires a climb of a-near 150 steps cut into the sandstone. Daily train services link Athens with the town of Kalambaka from where the monasteries can be reached by foot, or short cab ride. 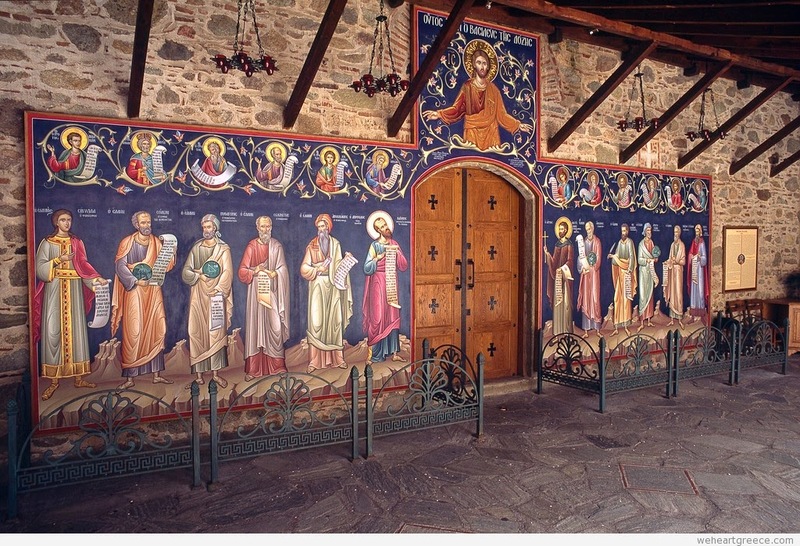 Two of the monasteries are open daily, while the others are closed at least one day a week.